The 19th century: surely the age of the showman and the hoaxer as much as it was the age of scientific discovery. For every Darwin who stepped forward to enlighten the public by dispelling superstition, there was a Barnum who was happy to provide them with some wonder – for a special discounted fee, of course. 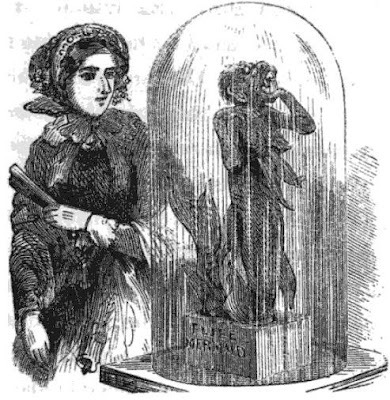 And for the price of a half-loaf of bread, any child of the 1840’s who was hard up for a little excitement could witness Dr. Griffin’s stupendous find, the Feejee Mermaid, courtesy of his business associate, Mr. Barnum. 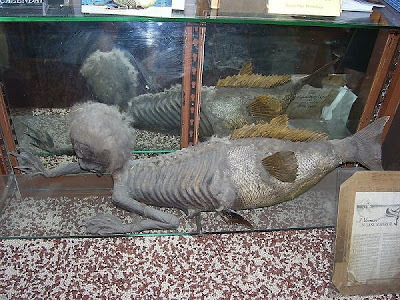 An ancient art form in the waters of the far East, these grisly composite animals are still known as ‘Feejee mermaids’ wherever they are found in honour of Barnum’s famous fake. 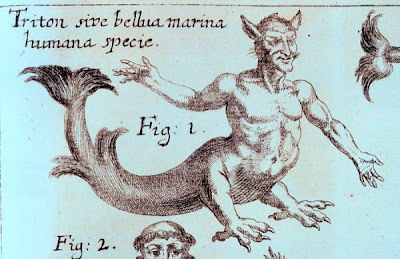 But while any student of the strange will know that the Feejee mermaid was just another of P. T. Barnum’s infamous hoaxes (as were Dr. Griffin and the fictional ‘Lyceum of Natural History’), only a more dedicated search through the annals of the strange will reveal that he was building on a much older idea. Indeed, it seems that no mythological creature is so improbable or silly that nobody has, with all seriousness, reported an encounter with one. 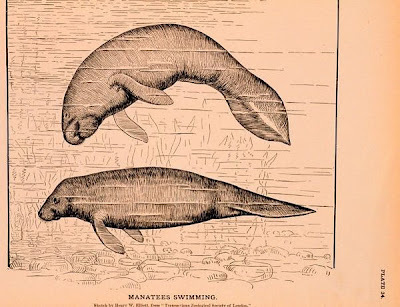 It is most often interpreted that what Columbus actually saw was a group of West Indian Manatees, large aquatic mammals native to the Caribbean. A single glance at one of these beasts is enough to convince that if this was the case, Columbus must have been using the word ‘mermaid’ in jest and not literally, as it is difficult to imagine any sailor confusing one of these chunky creatures for a beast that was part human female, even one with a face that was ’somehow’ like that of a man. That such historical documents are open to interpretation remains a stumbling block for those who wish to track the appearance of strange beasts throughout antiquity. Perhaps Columbus had drunk just a bit too much grog after being too long at sea; perhaps he applied the term as a symbolic name for this new species of animal. Or perhaps he really meant what he said. Pot-boiler books about the occult abound with other examples which prove difficult or impossible to track down and confirm, however they may fire the imagination of readers. In 1830 a strange corpse reportedly washed up on the beach at Benbecula in the Outer Hebrides, the wild and storm-ridden islands off the North-West coast of Scotland. It was about the size of a ‘well-nourished’ child, though its breasts, which clearly marked it as being female, were too ‘well-developed’ to have been those of a child. The creature had the hind-quarters of a fish, though without scales. Its skin was pale and its hair was black. 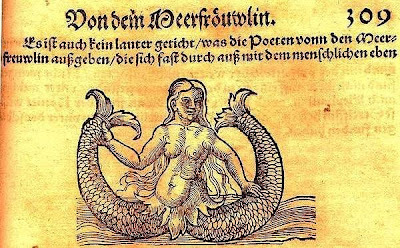 According to the folklore collection Carmina Gadelica, the mermaid was actually alive when first spotted, but frustrated villagers who failed to capture and instead stoned it to death. Regardless, town elder Duncan Shaw constructed a tiny coffin for it and gave it a Christian burial. Again, it is difficult to imagine a manatee demanding such treatment. Such tales continued well up until the end of the 19th century. 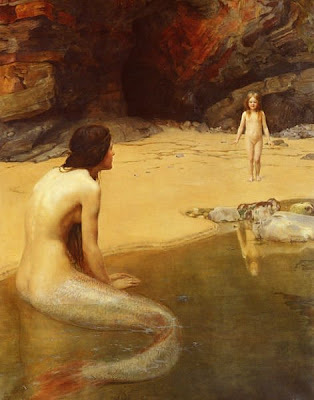 20th century mermaid sightings are sparser. A creature with the upper body of a human female and the hind quarters of a fish was reported by the crew of the Leonidas in 1917 as it traveled from New York to Le Havre in France. 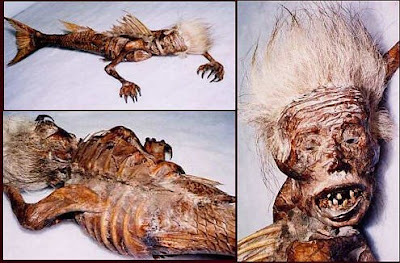 This account claims that the being, which had long black hair, swam alongside the ship for six hours, rising itself out of the water for up to fifteen minutes at a time, allowing all the sailors onboard to see it clearly; all agreed that it was a mermaid. As recently as August 2009, an alleged sighting brought tourists flocking to the town of Kiryat Yam in Israel. The creature appears for just a few minutes at dusk on certain nights. The town’s tourist board are taking full advantage of development, with a 1 million dollar reward for the first person to photograph it. So what is the dedicated student of Forteana to make of such tales? The problem with most of them is that they occurred so long ago that any investigation carried out would achieve nothing. No new information is likely to come about regarding them; they remain stirring stories from which few conclusions can be drawn. In fact, they are for the most part similar to the folktales of yore in all respects except that they are alleged to be true. Note the similarity between the tale of the Benbecula creature and my own fictional effort at the top of the page. Incapable of being debunked or confirmed, these stories are passed on like legends. As for the Israeli mermaid, in all likelihood the most important lesson it will teach us is that a good idea never dies. If the human need for wonder is as boundless as the waters of the ocean deeps, than strange tales of merfolk and other such creatures will doubtlessly continue. Most Wonderful Breathtaking Images On The Earth. Which is the most important part of the body?